A neat, convenient way to handle shine and excess oil anytime. Beautifully packaged blotting papers from Japan are the size of a credit card. 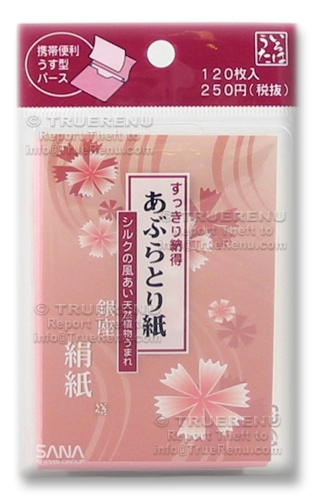 Control oily shine all day long with these beautiful blotting papers from Japan. Ginza papers are made with natural pulp, and have a silky feeling. Softly and gently absorbs excess moisture and oil from the skins surface. Wallet pack contains 120 sheets inside a moisture-resistant carry case. Japanese language pack with English ingredients enclosed. Whether you occasionally perspire through your makeup, or suffer from excessive shine-through ... don't wipe it, and your makeup, away - use these blotting papers from Japan. These delicate sheets are soft to the touch, but tough enough to literally wick away excess sebum from your skin without disturbing makeup. Good sized sheets, enclosed in a plastic carry case for portability and a little extra crush-resistance. Ginza sheets have a soft and silky feeling, made with natural paper pulp in a relaxing opaque pink shade. TrueRenu carries a wide variety of Blotting Papers - search for "TrueRenu Blotting Papers". Lay a sheet over the affected area and press lightly. Lift and repeat, using a clean area of the same sheet or another blotting sheet. Made in Japan, a gentle once weekly peel mask for all skin types, especially good for blackheads, acne and sallow skin. Eggshell membrane extract and collagen work together to smooth and moisturize. Page displayed in: 0.2646 seconds.